Journal of Pharmaceutical Sciences and Pharmacology is being launched to address the disconnect among different research areas related to pharmaceutical sciences and pharmacology. The extreme specialization has resulted in compartmentalization and complete segregation of disciplines related to pharmaceutical sciences. Relating a new development in drug delivery has become difficult to be noticed by the researchers in other related disciplines like the pharmacologists and/or clinicians. The aim of this journal is to publish high quality original research work and broad reviews in all related disciplines relevant to drugs under the same umbrella. Our expectation is that it will help the researchers, scholars and scientists to put their and others' work in the bigger context resulting in enhanced interdisciplinary and integrated research effort. 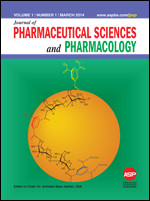 The journal is intended to cover all disciplines and challenges in science, technology and engineering that contribute to the development of new improved drug molecules and their uses including pharmaceutical aspects.